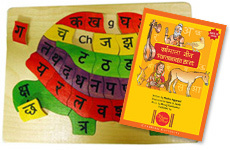 Created by established Hindi teacher, Madhu Aggarwal, the chart uses colorful images and an unforgettable tune to help both heritage and non-heritage readers learn the alphabet! Appropriate for all ages from toddlers to teens to university students! A fun way to teach! A fun way to learn! Along with the chart, you receive a beautiful handmade puzzle. Hindi pieces with corresponding English letters on the tray. Colors may vary. Handmade of treated wood.